As the Dancehall genre enters its biggest battle to date against politicians, bourgeoisie journalists and a seemingly well-established system determined to see to its demise, it has gotten timely reinforcement from a most unlikely source – the incarcerated but definitely not silenced Vybz Kartel. As the Jamaican government seeks to criminalize elements of Dancehall music it is fitting that it’s most notorious personality takes center stage to defend the genre even whilst incarcerated for nearly two years. Ironically, if there is any validity to the claim that Jamaican politicians and the Broadcast Commisions want positive music for youngsters, then they will endorse this CD from Kartel. 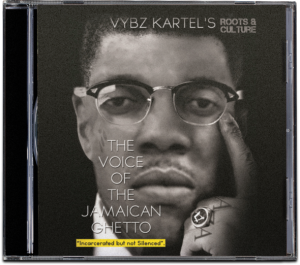 Kartel shows that he is still one of Dancehall’s leading innovators as this is the first popular Dancehall album that will have independent commentary before each song in a series of interludes. This is certain to do well in Europe, Asia and other areas where listeners are challenged by the dialect as the Commentator clearly explains Kartel’s thought process in making each song.